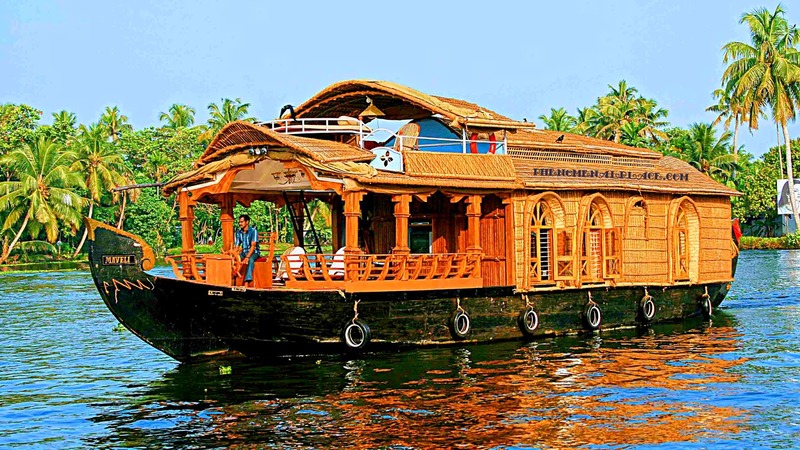 Alleppey Houseboat Trip is a unique and popular vacation activity in India. But if you don't do it right, it can be an unpleasant experience. What to expect? What facilities does a houseboat have? What kind of activities can you do? Read on, to save yourself from a screwed up experience and enjoy the houseboat trip. How Do I Get To Alleppey? The best way to reach Alleppey is to fly to Cochin airport (COK) and to take a taxi ride which lasts an hour. I recommend this strongly because the Indian trains and buses are unreliable and can be uncomfortable to ride. The next closest airport is Trivandrum (TRV) which is about 2 hours drive from Alleppey. Alleppey does have a railway station and is close to the jetty. How many houseboats are there in Alleppey? Alleppey has over 250 houseboats that cruise through the waters, making it appear like a water highway. This means that there are plenty of houseboats to choose from, once you reach Alappuzha (another name for Alleppey). However, in the peak season, houseboats can become unavailable due to large tourist population and prior booking is recommended. How to book a Houseboat? There are two ways to book these houseboats. The best way is to reach Alleppey, inspect a few houseboats and choose one that fits your needs. The other option is to book online or call the houseboat companies. What kind of Houseboats are available? Many different kinds are available. Deluxe houseboats, Premium houseboats, Luxury Houseboats, Honeymoon coupes are some of them. Some houseboats have an extra level on top, where you can relax privately without the interference of the crew. Houseboats are also classified as 1 bedroom houseboats, 2 bedroom houseboats, etc. How many people operate the Houseboat? There are typically three men in the crew: The Captain, Cook and a Supervisor. They are usually dressed casually. The supervisor should be able to communicate well in English, while the Cook and the Captain usually speak Malayalam, the local language. Please don't book a houseboat for more than 2 days. Unless you are a honeymoon couple, you will get bored sitting inside the boat. It's like sitting in a hotel room with a nice scenic view through the window. Alleppey is a small town, and two days is more than enough to explore the place. How to choose a good Houseboat? If you are in Alleppey, it is easy to inspect the Houseboat before you book it. If you are booking online or over the phone, ask for all the details of the boat and the company. Check their reputation on sites like TripAdvisor. I booked a company called "Brightwater Houseboats" and recommend that you DO NOT travel with them. Their houseboats are not well furnished and my experience was bad. How much do Houseboats cost? The cost varies roughly between $75 - $150 per couple for 24 hours. If you go as a family of four, it costs $200 - $250 per night. They charge you for extra beds or other requested facilities like TV. When should I do a Houseboat trip? You can book a houseboat anytime of the year, although the ideal months are December and January. Hot summer begins in February and lasts until June, and is not recommended for an average tourist. From July to October, it will be rainy and is likely to interfere with your exploration of Alleppey. What Food and Drinks can I expect? Be specific and ask for what you want to eat when you book the houseboat. The cook should be able to make you most of the Indian and Western cuisines. Note that alcohol is not readily available on houseboats. 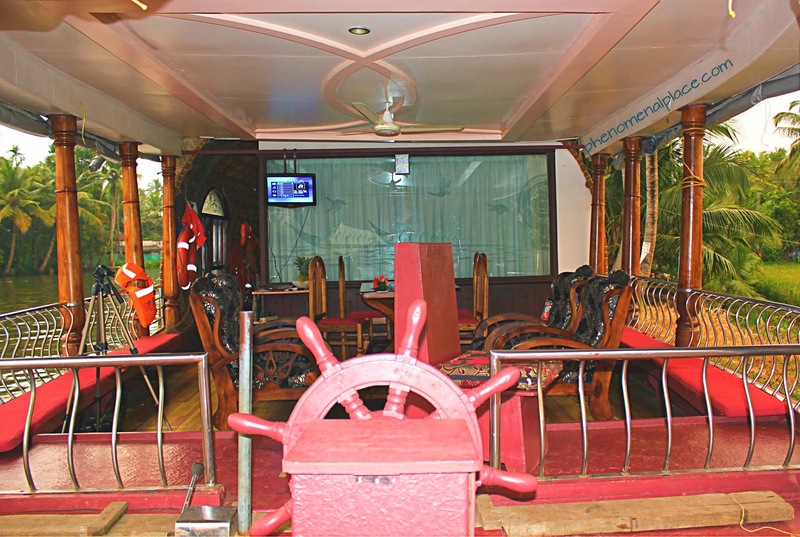 However, you can easily buy alcohol in Alleppey and enjoy it on the houseboat. Ask the Captain or the Supervisor, and they will purchase the alcohol for you. What's a typical Houseboat day like? You check in at noon. After an hour cruise in the waters, the houseboat will dock somewhere. Eat lunch on the houseboat, prepared by the cook. Two more hours of cruising, the boat will dock again. You can get down, go to the Alleppey beach or visit a temple and get back on the boat. The houseboat will be docked for the night and you can sit in the living area or go to your bedroom. Dinner will be served at your convenient time and you can call it a night. The next morning, you will be served breakfast, after which the houseboat will cruise for an hour before docking. You can get down and explore Alleppey again. When you get back to the houseboat, it will cruise back to the jetty. That's it. Front Deck/Dining: A houseboat typically has a dining/living area in the front deck. This is where you enjoy your meals and sit casually to enjoy the beautiful backwaters of Alleppey. Bedroom: Right behind the dining area is the bedroom. Depending on your booking, you can have one or more bedrooms. Your bedroom will have a bed, an air-conditioner and a bathroom. Don't expect electrical gadgets like TV or microwave, the houseboats try to minimize their consumption of electricity. Kitchen: At the back of the houseboat is the kitchen. This is where the cook prepares your meal. It is pretty basic and has some utensils, a gas stove, etc. Upper Deck (optional): Some houseboats have an upper deck furnished with a couch. This is preferred by honeymoon couples where they can enjoy their privacy while sitting in an open-air set up. Do you need 24 hour Air Conditioning? Yes, you do. While it is fun to sit in the front deck and enjoy the beautiful breeze, you will spend a lot of time in the bedroom too. For an average westerner, it is impossible to stay in the bedroom without Air Conditioning due to tropical temperature of Kerala. Electricity is a serious problem with many houseboats and most of them do not have the power to support 24 hour A/C. Be sure to confirm that you get a good houseboat that can provide this facility. What Facilities does a houseboat have? It depends on what you ask for. Some luxury boats are equipped with Jacuzzi and other ultra modern amenities. However, most houseboats have limited amenities and are devoid of microwaves, coffee makers and refrigerators. Therefore, it is very important that you double check that the houseboat has everything you need. What activities can I do in Alleppey? Enjoy The Backwaters: Sit in the front deck of the houseboat and you will be mesmerized by the scenic beauty of Alleppey's backwaters. It's free, relaxing and feels fantastic to watch coconut and banana trees all around you. Plenty of birds flying and people traveling in boats to schools and work are very interesting sights to see. 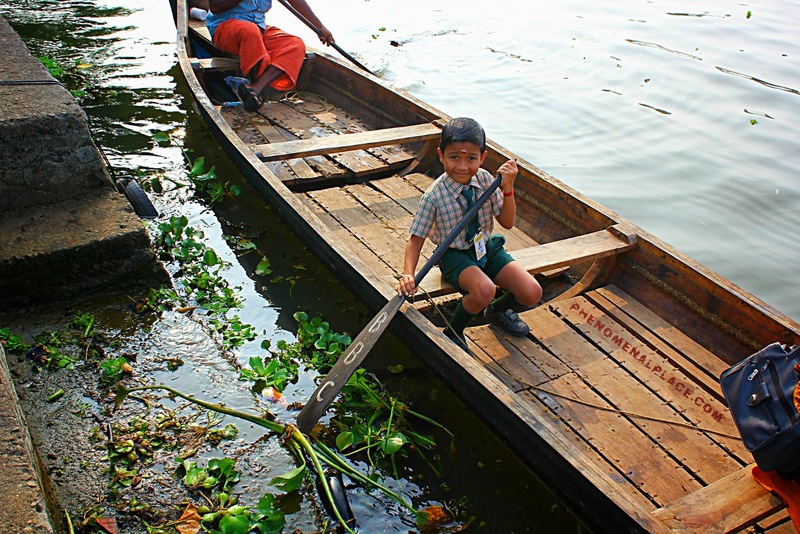 Forget bicycles, Alleppey boys take boats to go to schools! Fresh Catch Seafood: If you tell the Captain, he will take you to the local seafood shop and you can buy Crab, Fish, Lobster that have been caught a few hours ago. Most of these animals are alive and taste great. You'll have to pay for what you buy, and the Cook will make delicious meals with them. The Alleppey beach is famous for camel rides. Alleppey Beach: A nice, clean beach and is perfect to enjoy during evenings. Sunset at Alleppey beach is beautiful and gets a lot of tourists from 6 P.M to 9 P.M. You can ride the camel for 5 minutes and it costs you 50 Rupees ($1). There is also a small park nearby and a few souvenir shops. 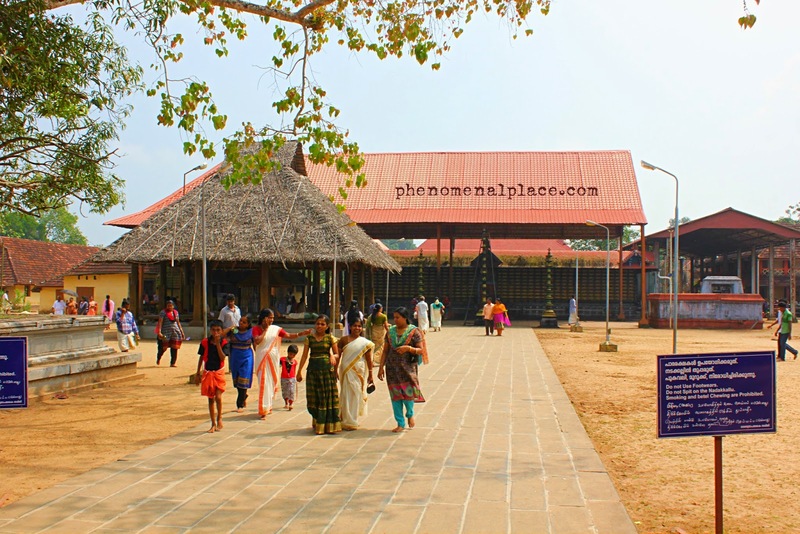 Alleppey City: There are plenty of attractions you can visit in this small town. The most popular ones are Secret Beach, Marari Beach and Revi Karunakaran Museum. Shopping and walking around the city are recommended for tourists. Alleppey Temples: There are many temples and churches and it is a good idea to visit at least one of them. The Ambalappuzha Sri Krishna Temple is the best temple in the city. The other popular temple is the Mannarasala Sree Nagaraja Temple. Chavara Bhavan Shrine: A serene place where most boathouses do a pit stop. 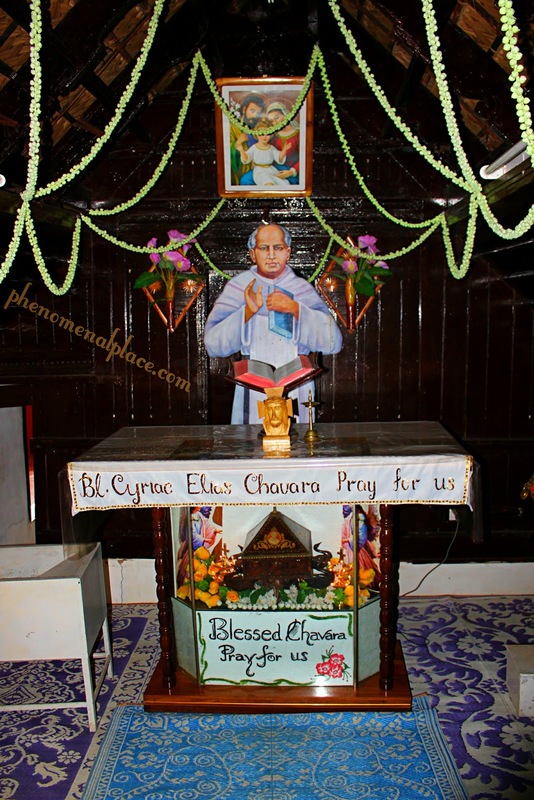 This was the ancestral home of Kuriakose Elias Chavara which now operates as a Catholic church. It is interesting to see the construction of small rooms done many years ago. I wouldn't call this a very exciting attraction, but is good for one time visit.Please read more about Chavara Bhavan here. 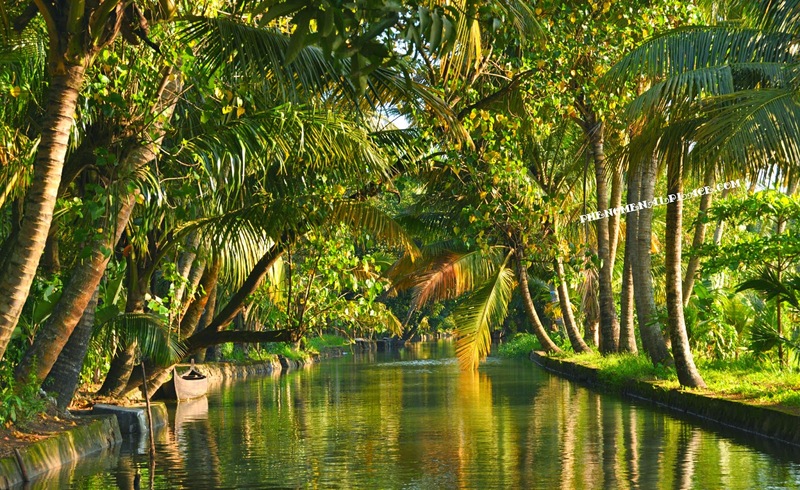 Alleppey's backwaters are a unique experience and the sight seeing is better than beautiful countries like the Bahamas and Fiji. 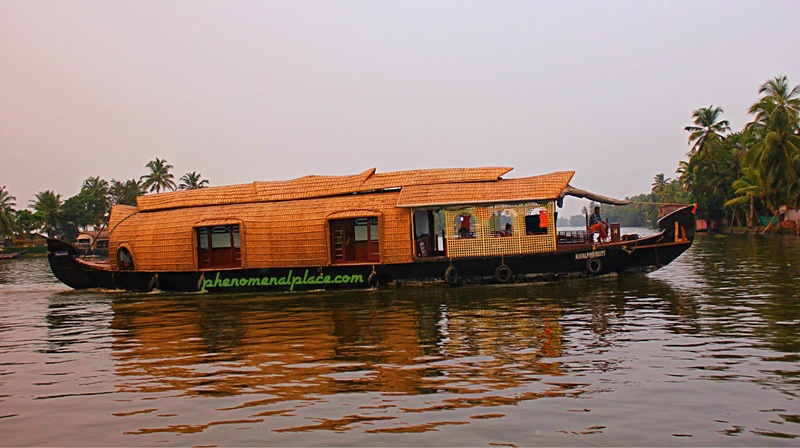 I hope this post was useful to your upcoming Alleppey Houseboat trip. If you have any questions, feel free to ask in the "comments" section and I will answer them. Good luck with your travel! Thank you Ramalingam, I hope this will help people from choosing the wrong houseboats in Alleppey and make their houseboat trip a pleasant experience. I came across on your blog see house boat as I'm fond of house boating. I've visited two times till now in Kerala and both times were fun a lot. I'm willing for go there once again!! Thank you for the comment Seema. I Wish you have lots of happy vacations! Kerala houseboat is one of the leading backwaters in India, here allepey is most wanted place for tourists. I like your post but since I'm travelling alone to Kerala would you suggest me some nice budget tips? Spot Booking is not always practical. In the present situation, it is not possible to predict the rush of guests. If the rush is very high it may result in unavailability or increase in rate, the increase incense may be double or triple the rates. There are a lot of other factors to look when booking a houseboat. You are doing a houseboat to enjoy the backwater more than staying on a houseboat. People come directly and negotiate the rate. If there is no rush some will reduce the rate even very cheaper. You think 'yes you got a houseboat for very cheap rate and you are lucky'. But what happened is you will miss the cruising experience. When they reduce the rate, they will equally reduce the quality of service by reducing the cruising time. So instead of 6 hours, cruising may get 4 hours or lesser than that. Then there is no value for money that you paid. What you saved by negotiating is not really a save. This is the reason for most of the negative reviews of houseboat seen on the internet. Before booking read and understand the operation of Houseboat. Book with a reputed houseboat service provider and get the real backwater experience. Its always better to Book your Houseboat with a trusted owner who can give you best services. Alleppey is place where backwater beauty of Vembanad lake can be explored in great way. Here it also operates Low cost boats to High Luxury boats and its always better to choose your service operator according to your needs. It good to know the Houseboat routes , meal plan, check in and check out timings before you fix an houseboat for your Alleppy trip. Extremely helpful information about the classification of houseboats and History of Kettuvallams. I would like to know more about the houseboats packages. It will be helpful if you share the details. These were the places i was actually looking forward to spend my vacation. I have been to Alleppey last year. Journey in Alleppey houseboats was wonderful. Thanks for sharing more unique places in India. Keep posting more interesting articles. Hi..any1 pls reply..getting into houseboat is easy going ..as i cant climb steps..pls tell me..am going to visit in next week. How can we book houseboat online and be assured of their good service ? What if the houseboat is not the same as promised ? This is a perfect boat for traveling across the rivers, but unfortunately, it is too big for Italy, for example. Hey, I hope you had a wonderful trip. Here is a tip for next time. This is a great tour operator. Check out the link. Wow! Your article is so detailed! Check out this website. They have good house boat packages. BackwaterTrip - Online Houseboat Booking Platform,We are Kerala's leading online Houseboat & Shikara booking platform. We offer luxury Houseboats,Super Deluxe ,Deluxe Houseboats, Shikara booking at affordable tariff price. We provide verity of Houseboat cruise Packages which include Honeymoon Special Packages, Family Trips,Friendship Special Pack, Corporate Team Out,Houseboat with Business Meeting Hall, Group Trips etc..